With most teams now having 20 games under their belt the philosophy around creating the weekly rankings will evolve. Prior to this point a heavy emphasis had been put on potential and the projected ability teams have to compete for the national title. That’s why teams like West Florida in D-II, Bellevue in the NAIA and Whitworth in D-III are hanging around the Top 25 despite not having winning percentages usually associated with the best schools in the nation. While hope hasn’t completed faded, those teams are running out of time for a change in momentum and to perform as prophesized. If teams continue to drop games and lose series they were anticipated to win, it is becoming time to lower expectations and come to the reality they simply may not be that good. With this latest update of small school rankings the projected ability and on-the-field accomplishments is weighted about 50/50. After this week losses will be more impactful and wins more meaningful. Rankings are based on games through Sunday, March 5. The top 10 teams in D-II remained unchanged after a week in which the on-the-field results went more or less as anticipated. Most teams had a single loss and the only club that suffered multiple setbacks was Minnesota State, who were playing in their first action of the season. Tampa and Nova Southeastern both staved off serious competition from surging teams in the middle of the Top 25, to further entrench themselves at the head of the table. It was a dismal week for touted teams in the Midwest Region as Southern Indiana and Quincy fell out of the rankings and Wayne State slipped to the 25th position as each of the three failed to win their weeks. The benefactors of the Eagles and Hawks’ mishaps were Mt. Olive and Chico State who enter the rankings for the first time this season. It was an especially worthy debut for Mt. Olive who beat down Barton in a three-game sweep after winning midweek games against Lake Erie and St. Augustine. The Trojans’ winning ways have been on the coattails of jaw-dropping senior seasons submitted so far by Ricky Surum and Austin Hutchison. Surum has been masterful on the diamond, hitting .467 with 16 extra-base hits for a .827 slugging percentage. He’s also only tallied a single error in 87 changes for a .989 fielding percentage at shortstop. Hutchison put up very good numbers last season, but nothing like the freakishly impressive stats he’s generating this year. In five starts he’s thrown three shutouts and held opposition to a .176 batting average against the ilk of USC Aiken, Florida Southern and Lander. As impressive as Mt. Olive has been this season, taking home the Conference Carolinas championships won’t be easy. North Greenville has been gosh darn good this season too and Erskine isn’t looking shabby either. Chico State, the other team making their 2017 rankings debut, has a pitching staff which has already thrown five shutouts, including a pair last weekend which raised their current winning streak to eight games. The pitching prowess in Chico isn’t limited to a few dominating arms as the skillful stats are being created up and down the staff. No Wildcat hurler who has pitched at least six innings has an ERA over 3.00 so far this season. After playing their first road series this week, the Wildcats have an impossible to overemphasize Top 25 showdown with conference rival Cal Poly Pomona, their second big series of the year after splitting with Point Loma to start the season. West Florida, who was ranked third in the preseason, lost their second series in a row and are in danger of dropping out of the Top 25 completely. Upcoming matchups against good-but-not-great Alabama-Huntsville and Embry-Riddle give the Argos an opportunity to right their ship against quality competition and prove they’re worthy of being a national title contender. Dropped out: Southern Indiana (19), Quincy (23). Faulkner continued to dominate opposition and close the gap between themselves and top-ranked Keiser. The Eagles outscored Blue Mountain College 28-2 and will likely have some more lopsided wins this upcoming weekend against Brewton-Parker. Faulkner has been an absolute offensive juggernaut, nearly tripling their opponents’ run total, out homering them 28-3 and batting .115 points higher. Those numbers do come with a caveat however. In the two games they’ve played against teams currently ranked in the Top 25, the Eagles only mustered one-run wins; their other 18 victories have been against schools nowhere on the ranking’s radar. It won’t be until later this month when the have a series against a high caliber opponent when they visit Georgia Gwinnett. It was another climb in the rankings for perennial power Oklahoma City. The Stars won four games last week and reached double-digit runs in each of the contests. Unlike Faulkner, OCU has tallied their 20 wins against a rather imposing roster of opposition including previously ranked York and MidAmerica Nazarene, as well as Bellevue and Tabor. Their latest wins have propelled them into sixth place in the rankings after starting the season at No. 20. With their upcoming schedule they appear to be a lock to remain in the top 10 for the rest of the season. City still has series against Wayland Baptist and OSAO who are quality caliber clubs, but it will be tough for either of them, or anyone for that matter, to usurp the surging Stars. Debuting in the rankings for the first time this season is LSU Shreveport. The Pilots lost almost their entire starting lineup and two of their starting pitchers from last season, but an influx of young talent and talented transfers has the team staying competitive without missing a beat. David Salgueiro has been unhinged on the basepaths, already stealing 20 bases while batting .424 and mammoth slugger Matthew Hammock is hitting .392 with a .522 OBP. The pitching staff has come into form as well which is a tip of the to the job neophyte Head Coach Brent Lavallee has done since being elevated to lead skipper. In two weeks LSUS hosts Texas Wesleyan, the team they displaced from the rankings. Dropped out: Texas Wesleyan (18), MidAmerica Nazarene (25). Cortland State didn’t make the decision to keep them at No. 1 easy as they lost to Johns Hopkins, but the defeat came courtesy of a two-out, two-run homer in the bottom of the ninth so the Dragons continue their season-long string atop the D-III rankings. While Birmingham-Southern and Emory are playing brilliant ball and worthy of receiving the top-team label as well, a team within striking distance of the No. 1 position is Shenandoah. After already earning wins over La Roche to start the season, the Hornets have a perfect 10-0 record after outscoring CCNY 27-5 in a pair of games last week. A win over 19th-ranked Salisbury could make SU’s March 15 game against Cortland a contest for the division’s top team. Over their last six games Centenary has scored a whopping 111 runs – that’s 18.5 per contest. While those wins haven’t been against the mightiest of opponents, it’s important to note those the final boxscores could have been easily even more lopsided had the games not been called due to the mercy rule. In just one inning of a game Sunday the Gents crossed the plate 17 times. All but one of Centenary’s starters is batting over .300 (the holdout is at .295) and the Gents are playing high caliber defense to boot with a .973 team fielding percentage. Centenary could make things ugly once again this weekend when they start SCAC play week and face Austin College, who currently is 4-11 overall. The Gents could go deep into the postseason if they keep compiling runs just as their conference mate Trinity did last year when they took home the nation title. 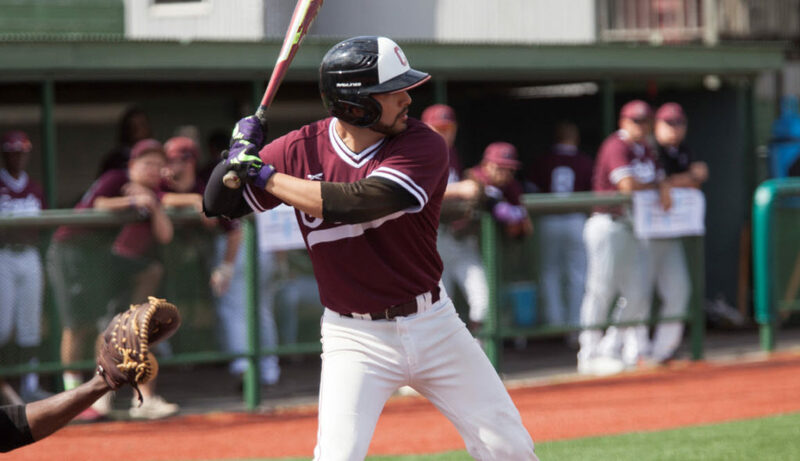 A surprising addition to the D-III rankings are the Roanoke Maroons who took two games from previously ranked Susquehanna and showed that their series win against Frostburg State to start the season wasn’t a fluke. The victories improved their record to 12-2 and they’ll surely add a couple more wins this week at The Ripken Experience in Myrtle Beach. Games against top-ranked Cortland State and Shenandoah await the Maroons later this month which will be the ultimate measuring stick of how good this club may be. Also new to the rankings is Johns Hopkins. In addition to their aforementioned win over Cortland State, the Blue Jays had a win over last season’s national title game runner-up Keystone. Hopkins can also claim a win over 12th-ranked St. John Fisher to start the season. Dropped out: Kean (19), Susquehanna (22), Buena Vista (24), Wartburg (25*).